Mulch is one of the easiest and most affordable ways to save water, especially during these extreme weather conditions. Here’s what you need to know about this drought staple to keep your garden and pot plants thriving. Mulch is a layer of material that is placed on the surface around plants to enrich and insulate the soil. Organic mulch is derived from plant or animal sources and is considered most beneficial. Examples include compost, mushroom compost, pine needles, grass clippings, bark chips and leaves. It improves soil fertility as it slowly breaks down, and will need to be replaced eventually. Use partially decomposed organic mulch (compost) to enrich soil and encourage plant growth. 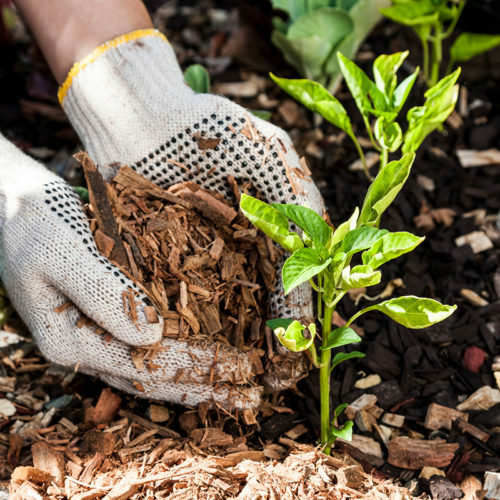 Use fresh organic mulch like wood chips and bark to control weeds. Inorganic mulch doesn’t break down, but acts as a physical barrier to retain soil moisture. Examples include stones, gravel and plastic/landscape sheeting. Stones stabilise areas prone to washouts and sheeting is ideal around foundation plantings. Loosen soil to improve ventilation. Sandy soil requires a thicker layer of mulch than clay soil. Areas that have a fairly high summer temperature need a thicker layer of mulch. Leave a space between the mulch and the stem and trunks of trees and shrubs. Do not place mulch over seeds that have not germinated – they require light and oxygen to sprout.